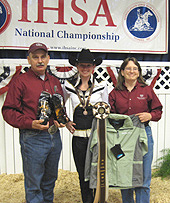 Seen here with Head Coaches Dr. Gary Webb (on left) and Sue Webb, Lauren Eagles of Missouri State University (center) finished eighth in the individual AQHA Trophy division at IHSA Nationals on May 9th. A sophomore from Mount Vernon, Missouri, Eagles earned the fifth-highest rail score out of 22 riders entered in the individual AQHA division. The judges must have liked the shine on Monica Shea's boots, for the Southern Illinois (Carbondale) junior from Plainfield, Illinois was sixth in the individual novice over fences division at IHSA Nationals in Lexington, Kentucky on May 6th. 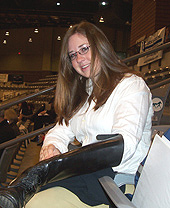 Shea (pictured) earned the top ribbon for any Zone 9, Region 2 undergraduate rider during the entire 2010 IHSA Nationals show. Schools competing in Zone 9, Region 2 during the 2009-2010 school year: Augustana College, Black Hawk College, Illinois State University, Illinois Wesleyan University, Iowa State University, Kansas State University, Missouri State University, Northern Illinois University, Northwest Missouri State University, Northwestern University, Southern Illinois University at Carbondale, Southern Illinois University at Edwardsville, Truman State University, University of Kansas, Washington University and Western Illinois University.